Darlings Supper Club have gone back to their original vision to bring us the food we ways knew they could. If you take away anything from this blog post, I hope that it’s this, when you’re passionate about what you do, you will find a way to succeed. Though I didn’t visit when they first opened, Darlings were honest about the difficulties they had faced in finding the team and menu that they were looking for. They’ve made some changes and now they’ve got it right they couldn’t wait to share it with the foodie community. 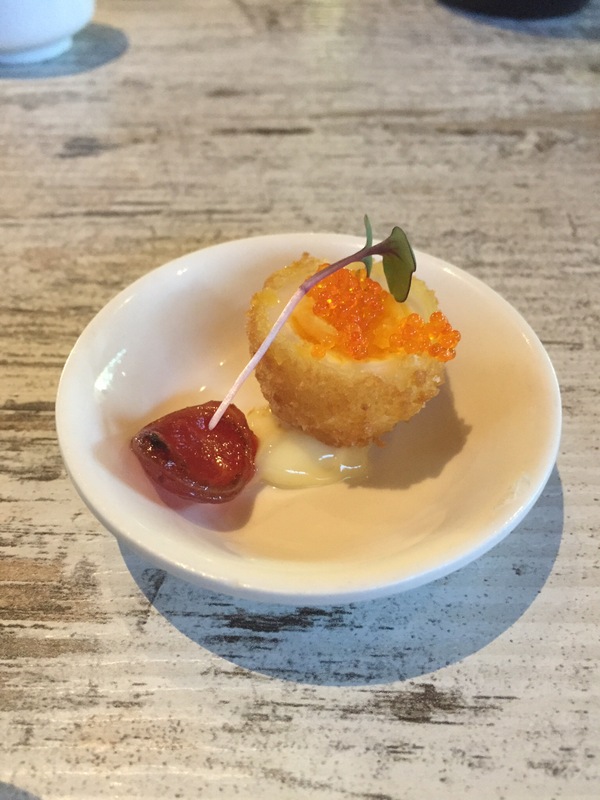 I was lucky enough to be invited to the bloggers banquet to give the new and improved Supper Club a try. Darlings is an Asian fusion restaurant with a difference, focusing on being open for those late night cravings for dumplings in Northbridge and bringing together talents from across the globe to make it happen. Their new team includes Sashimi King Youngwoo from South Korea, the Chopper from Iron Chef Thailand, and Head Chef Joel who has honed his talents all over Australia. Now what we have all been waiting for, the food! We started with crumbed quail egg, served with Chinese lap cheong sausage and micro red cabbage leaf. This was a relatively simple dish with hidden sophistication. The egg yolk was the perfect ooze and the creamy texture was a fantastic contrast to the light but crispy crumb. It was a lovely way to start our meal. 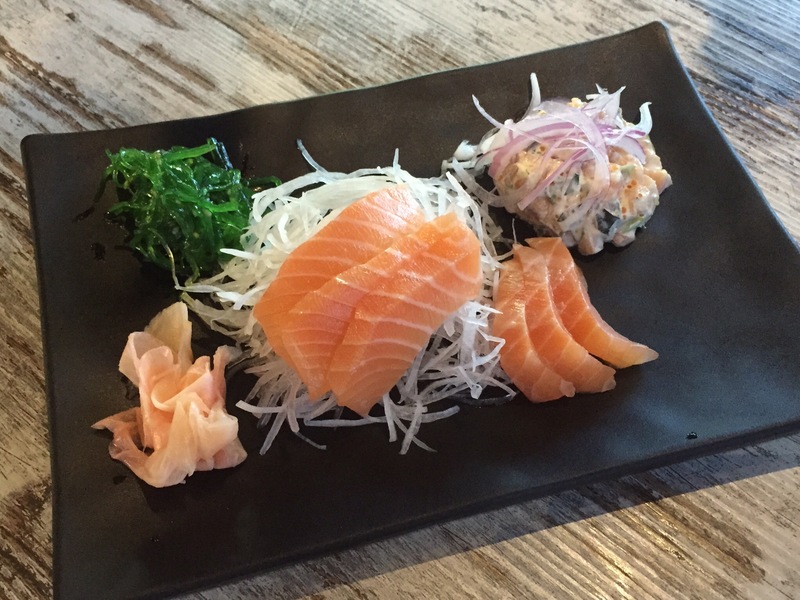 Next up was the sashimi from the King. Aside from the lovely presentation this was a delicate and nuanced dish. It was obviously super fresh and wasn’t fishy, the salmon just melted in your mouth. It was served with a light and crispy salad as well as a sauce with a slight tang. 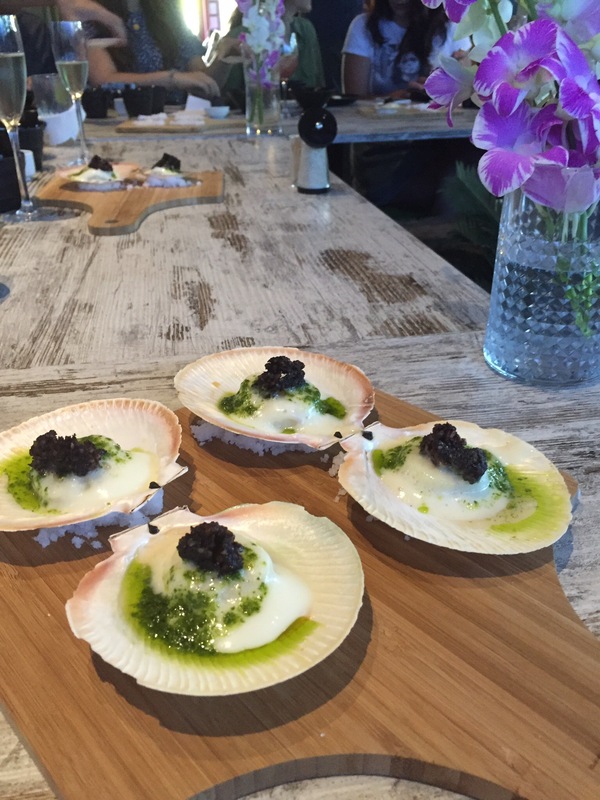 The Rottnest Island scallops were beautifully presented and served with a coriander pistou, potato foam and five spice black pudding. Of all the dishes this probably was the one we enjoyed the least, the flavours weren’t that distinctive and the texture of the scallop wasn’t as good as we would have liked. It just didn’t pack as much of a punch as the dishes that came before it unfortunately. 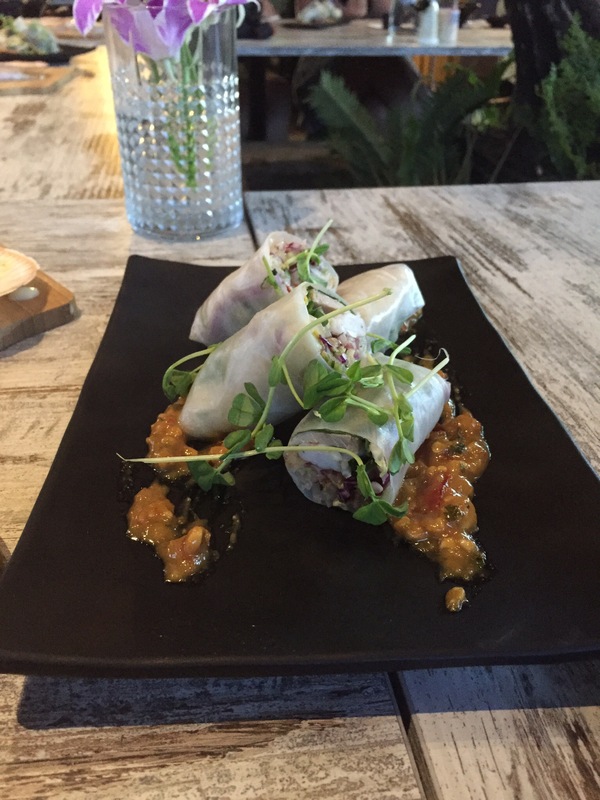 The next dish to come to our table was the confit pork and prawn fresh spring roll, served with a deliciously spicy cashew sauce. The sauce was truly the best bit, nutty and spicy and delicious. The prawn flavour was really mild compared to everything else but it was nice and fresh dish with classic and yummy flavours and a lovely mix of textures. One of our favourite dishes was the teriyaki octopus with soba noodle salad. The octopus was hot and delicious with a nice hint of char flavour. The hot octopus and the cold noodles provided a great juxtaposition. 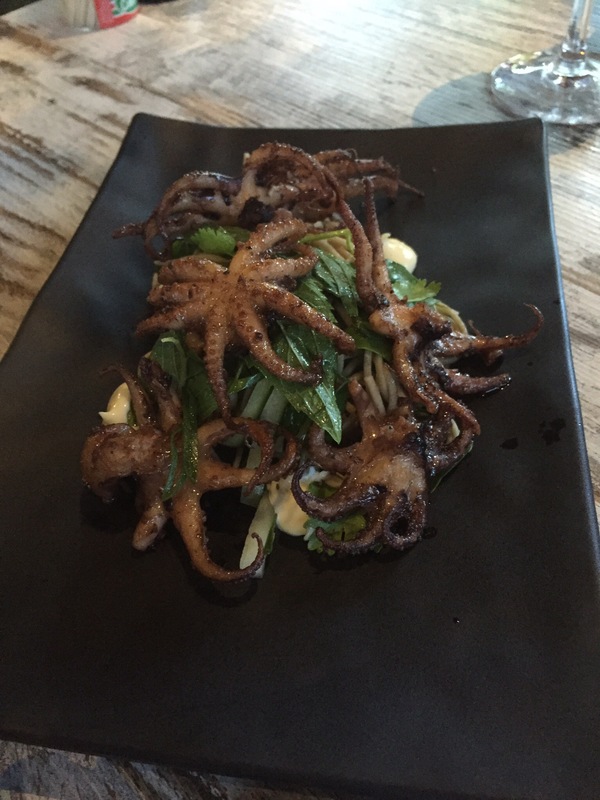 The salad was so light and refreshing and the octopus was packed with flavour that was allowed to shine through. Next up came agedashi tofu served with the most beautiful ‘watermelon’ radish. It was served with pickled shiitake, asparagus and miso. 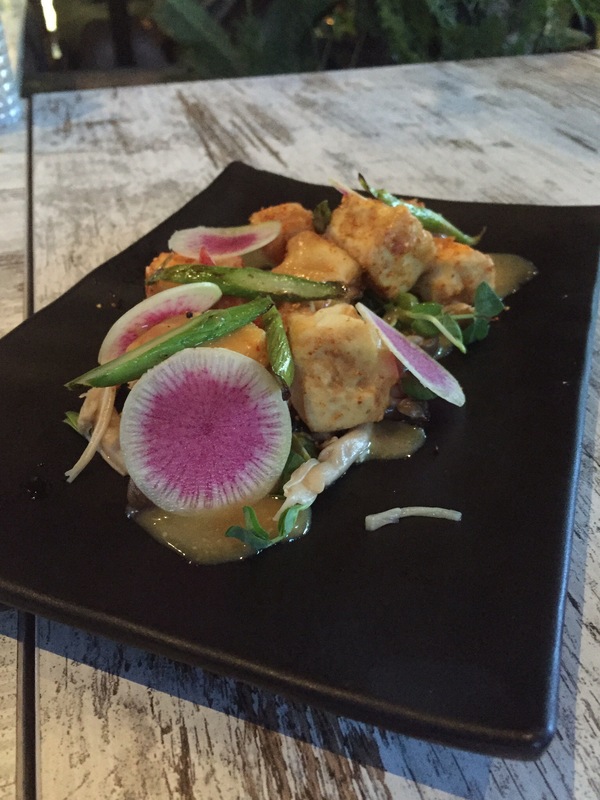 The tofu was the star of the dish, silky and smooth with a light fry. This was a flavoursome and interesting vegetarian option. 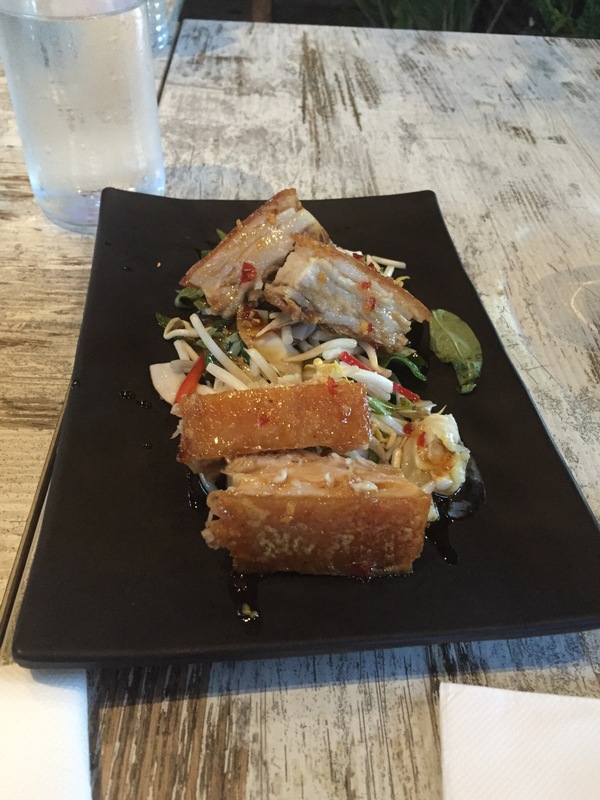 The pork belly was simply heaven on a plate, one look at the crackling was enough to make us very happy diners. 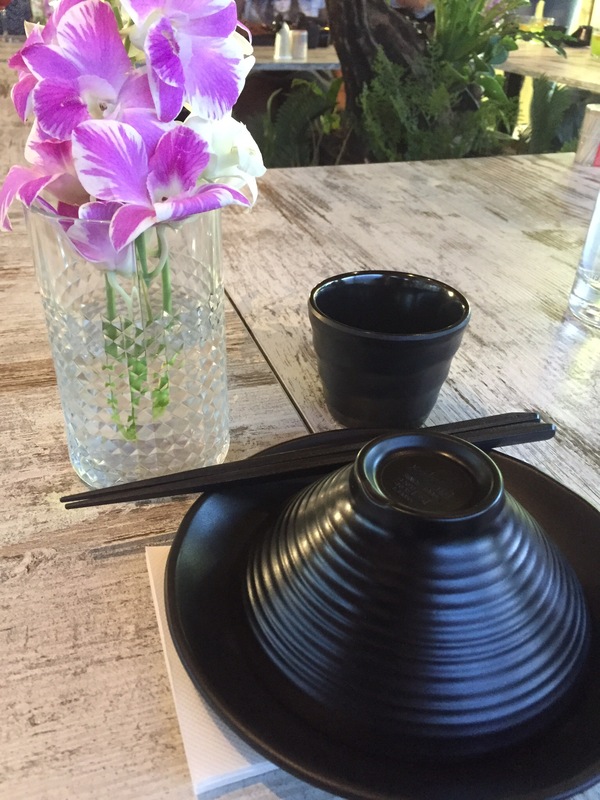 It was served with a coconut, sprout, lychee and chilli salad, a delectable mix of spicy and sweet. The melt in your mouth, succulent pork was a perfect compliment to the light and crisp salad. The use of lychee really made this dish something special, it was that hint of sweet, and unique texture that you kept coming back to long after you’d finished the dish. This was a real winner! 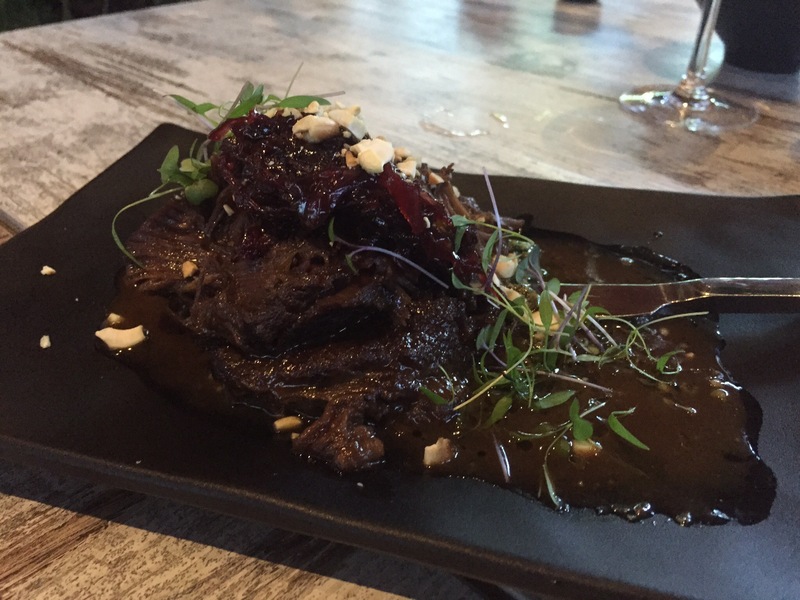 Next up was a real meaty dish, braised black bean beef cheek served on coriander pesto with a red cabbage marmalade. The beef was delectably tender and juicy but was best eaten with everything together. The sweetness of the marmalade helped cut through the richness of the meat and the pesto was a nice accompaniment. With four bloggers tucking in we didn’t quite get through this dish, just a bit rich, but we loved what we could manage. 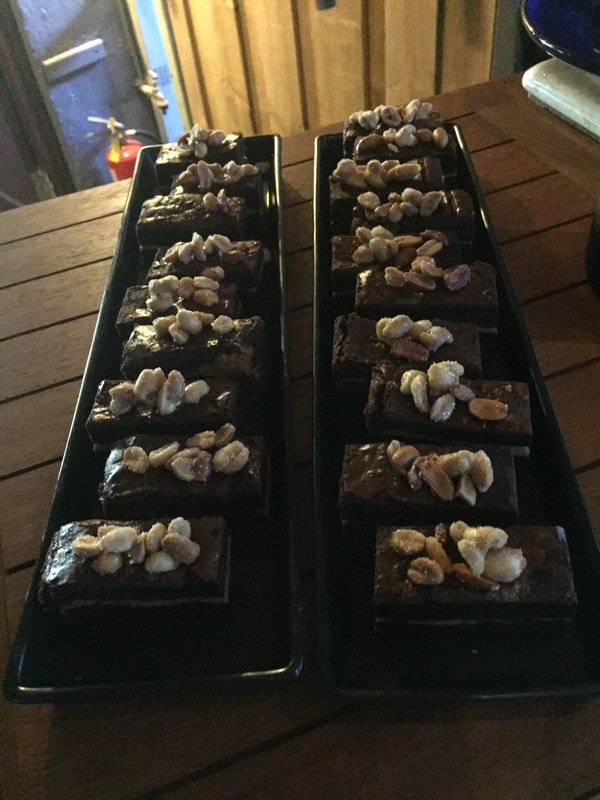 When we could take no more, out came the dessert trolley, loaded with macarons and snickers slice. We’d just been discussing the intricacies of the macaron v macaroon confusion (it’s maca-RON, maca-ROON is a whole other food) and were delighted when they appeared in front of us. The desserts are from the same face behind the Flour Factory’s treats, Brendan Owens. 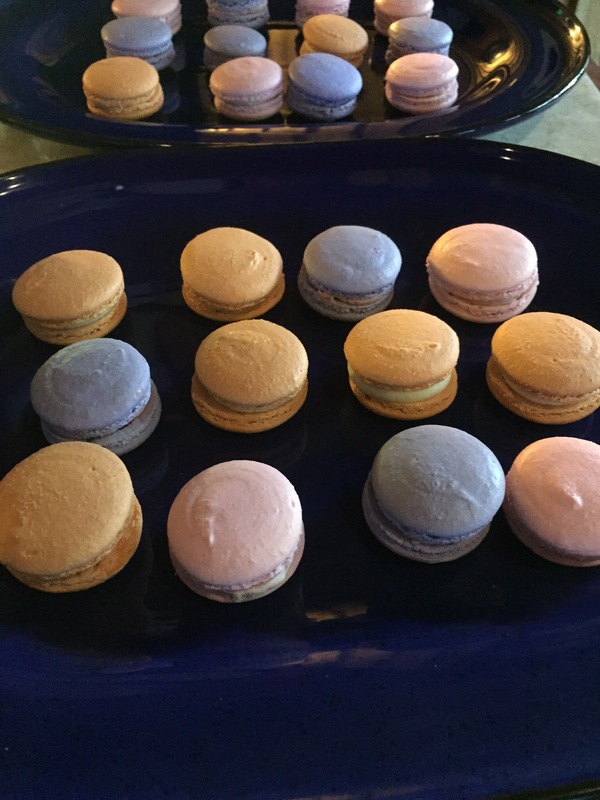 The macarons were delectable, crispy shell, meringue like inside, and with delicious fillings. They came in white chocolate, lavender and peanut butter. Darling’s take on a snickers was utterly indulgent, so full of chocolate and almost fudgy at the base. The peanut flavour really couldn’t compete with all that chocolate but the caramelised peanut on top was a nice touch. Both options were a delicious way to end a very enjoyable meal. Darlings put on a fantastic banquet and there are some delicious Asian fusion eats to be had. If you’re a fan of late night feasts, or just a cocktail or two, you’ll want to visit the new and improved Darlings Supper Club.